Product inspection is a vital step in managing product quality for importers with suppliers in China. AQF’s inspection services are catered to your specific product, requirements and budget. AQF has strong experience inspecting a variety of product categories, from automotive components and consumer electronics, to textiles and footwear. Why conduct product inspection in China? China has risen in recent decades to become a global manufacturing hub with factories ranging in both sophistication and quality. Product inspection remains one of the few reliable ways for you to confirm that your products meet your expectations before shipping. By sending skilled professionals to your supplier's facility with your product requirements and criteria in hand, you can receive a timely and detailed report of your goods. This report is your key to understanding the situation at the factory, knowing the true condition and status of your order and being able to make an informed shipping decision. 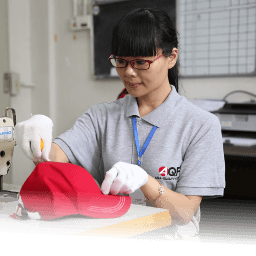 Why hire AQF to conduct product inspection in China on your behalf? High integrity - You'll be working with a QC provider that takes specific measures to prevent bribery and other forms of corruption that could compromise your product quality. With steps like regularly rotating inspectors, enforcing a strict Code of Ethics and requiring inspectors and supplier staff to sign off on the inspection report and our Factory Integrity Declaration Form after each inspection, we ensure that your inspection results are accurate and no misconduct has taken place. Global support team - Our client support team is fluent in English, Spanish, French and Chinese and readily available by phone, email or Skype to book a service, communicate requirements and clarify inspection criteria or results. They can also travel with you to meet with your supplier and discuss your expectations face-to-face. Swift reporting - You'll receive a full inspection report by email typically within just 24 hours of the completed inspection. Flexibility - You can schedule inspection in China any day of the week in as little as 24 hours. You also get flexibility with regard to inspection criteria, as AQF's technical team will tailor our procedure to meet your specific needs and quality concerns. 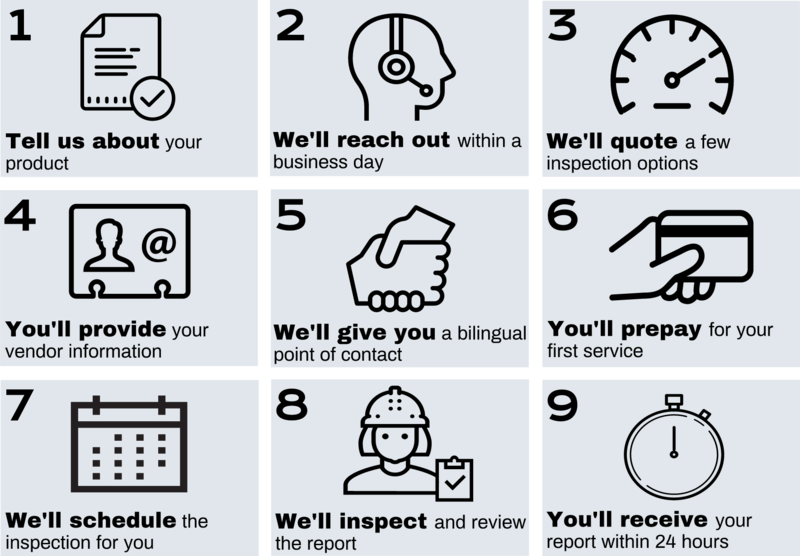 We follow a clear, step-by-step process to arrange your service as quickly as possible, perform inspection, issue a detailed report and follow up with you to ensure you fully understand the results. Developing inspection criteria - Before booking, we'll suggest specific checks and on-site testing for inspection and can help you create a custom QC checklist for your product if needed. We'll also offer you several inspection options with different sample sizes to fit your budget. Booking inspection - Once we have all your product and order information necessary and have confirmed the service, we'll work with your supplier to arrange inspection when you need it. Pulling a random sample - Once we've confirmed the inspection date with your supplier, our inspectors travel to the factory on the appointed day to conduct inspection. They begin by pulling a random sample (unless you've specified a 100-percent inspection) of units from production, typically based on AQL standards. This ensures you get a representative look at your order. Checking the product and packaging - Our inspectors individually check each unit in the sample size by hand, confirming your specifications, including color & dimensions, function and more. If available, staff will also inspect retail packaging and shipper cartons to verify sealing method, labeling, weight & dimensions and more. Conducting on-site testing - Inspectors will conduct any on-site tests relevant and necessary for your product, such as hi-pot testing for consumer electronics or fabric density check for garments and textiles. Issuing the report - Within 24 hours of inspection, our staff will issue you their detailed report by email, complete with photos and remarks showing the condition and quality of your product and any issues found. They can also send you video footage of the product or factory if needed. Following up and interpreting results - Our global support team is available to discuss any part of the inspection, results and suggested corrective action plan to address any quality issues. They can help you clarify results and answer any questions so that you can address any problems with your supplier appropriately. Quality experts at AQF are standing by to assist you with managing your product quality through product inspection in China. Contact us for a detailed quote now by clicking the button below!